If you want a book that will keep you reading way past your bedtime...will have you convinced that you know how it will end and then to find out in the next chapter that you were totally wrong...that has an ending that you won't see coming....If you are looking for all that and more, The Widower's Wife is the book for you. Ana and Tom Bacon and their daughter live in extravagant lifestyle until Tom loses his job and they have no income to support their family. They are in debt over their heads and will soon lose their house. While on a short cruise, Ana falls overboard, When Tom tries to collect the ten million dollar insurance policy, the insurance company sends Ryan, a former NYC detective, to investigate whether Ana fell overboard or was pushed. This is an intriguing story with a crisp plot that will keep you rapidly turning pages. The story is told in alternating chapters by Ana about the past and Ryan about the investigation. It was a great way to tell the story so that the reader sees the entire story. 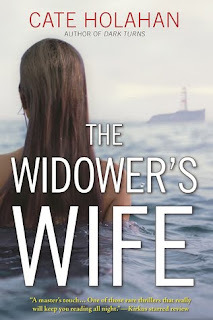 Catherine "Cate" Holahan is the author of not only The Widower's Wife (August 2016) but also Dark Turns (November 2015), both are published by Crooked Lane Books. An award-winning journalist and former television producer, her articles have appeared in BusinessWeek, The Boston Globe, The Record and on websites for CBS, MSN Money, NorthJersey.com, BusinessWeek.com, and CNBC. Her short fiction won first place in the 19th annual Calliope competition, a magazine published by the writer's group of American Mensa. Keep an eye on this author, I think we'll see some great books from her in the future. Susan Roberts lives in North Car when she isn't traveling. She and her husband enjoy traveling, gardening and helping to take care of their grandson. Susan reads almost anything (and the piles of books in her house prove that) but her favorite genres are Southern fiction, women's fiction and thrillers. Susan is a top 1% Goodreads Reviewer. You can connect with Susan on Facebook.